The appliance comparison lists hardware and software features available. STORServer specializes in built-to-order enterprise data backup appliances. Each backup appliance solution is tailored to our customer’s unique environment. These solutions help simplify complexity and feature best-in-class data backup, archive and disaster recovery software and services that can expand reliably to meet changing requirements. Here is a comparison of some of our more popular models. Please contact us so we can work with you on a custom solution that best fits your business requirements. INTERNAL DATABASE EXPANSION Up to 1 480GB pair; DB SSDs config’d in RAID6; 960GB usable (1.92TB raw). Database expansion prevents option for internal storage expansion Up to 2 480GB pairs; DB SSDs config’d in RAID6; 1.92TB usable (2.88TB raw). Database expansion prevents option for internal storage expansion Up to 2 960GB pairs; DB SSDs config’d in RAID6; 3.84TB usable (5.76TB raw). Database expansion prevents option for internal storage expansion Up to 2 960GB pairs; DB SSDs config’d in RAID6; 3.84TB usable (5.76TB raw). Database expansion prevents option for internal storage expansion Up to 2 960GB pairs; DB SSDs config’d in RAID6; 3.84TB usable (5.76TB raw). Database expansion prevents option for internal storage expansion Up to 2 800GB pairs; DB SSDs config’d in RAID6; 3.2TB usable (4.8TB raw). 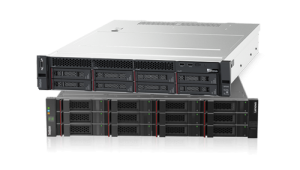 Reduces number of internal RAID5 storage arrays to 1. CAPACITY OF STORAGE ENCLOSURES (BOTH BASE AND EXPANSION) 60TB, 80TB, 100TB All amounts are usable, RAID6. 60TB, 80TB, 100TB All amounts are usable, RAID6. 60TB, 80TB, 100TB All amounts are usable, RAID6. 60TB, 80TB, 100TB All amounts are usable, RAID6. 60TB, 80TB, 100TB All amounts are usable, RAID6. 60TB, 80TB, 100TB All amounts are usable, RAID6. Processing Daily Performance for Sizing – maximum daily change rates are different when some added features are turned on. Projected maximum is based upon sufficient and fast enough remote storage for DR. The maximum cannot consider each customers unique variables when deduplication or replication activities are running. Commvault requires both dual CPU and 10Gb network capabilities. 10Gb network available as an option. *Last Update 02/2018. Please contact your STORServer Sales Representative for up to date options.